I’ve attended Stuttgart’s 5th Barcamp this weekend. Part of the event is always an introduction, where the attendees say their name and three of their main interests. The intention here is to make it easier to find interesting people and as icebreaker. Unfortunately, as the event kept becoming more crowded every year, it was also increasingly harder to actually see the people as they introduced themselves. Luckily we’re all just a bunch of nerds, so we came up with the idea of having a moving camera. 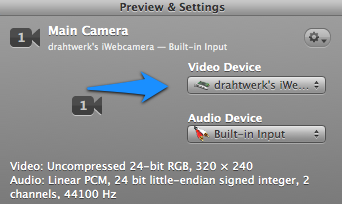 iWebcamera: Not beautiful but works. Mobiola Webcamera: Not updated since 2010. Has pixels. Instructions are for iOS and OS X. Sending the video is easy as pie. Just follow the instructions of either app. This usually means you have to install some driver. 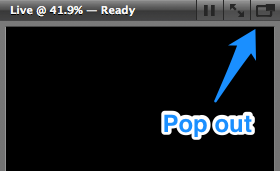 Then get a desktop app that displays the video. Unfortunately all Apple apps won’t work with non-Apple certified equipment. So PhotoBooth, QuickTime Player and iMovie are out. Almost all third-party apps support these QuickTime Extensions though. Skype does and so does BoinxTV — which I used. Admittedly BoinxTV is a rather expensive investment for an otherwise so openly organized event like Barcamp. It’s not a requirement though. Other free apps like Macam support third-party cams as well.2 All you need is basically an app that reads these third-party QuickTime Extensions. UPDATE: I played about with CamTwist recently and found that it can do pretty much anything BoinxTV does, but is absolutely free and not as straightforward to use. There are a lot of good tutorials online. BoinxTV, apart from being a great live event video app, is able to add “layers” on top of the camera video. There’s a layer to display a Twitter search for instance. Everything can be activated and deactivated with assignable keyboard shortcuts. 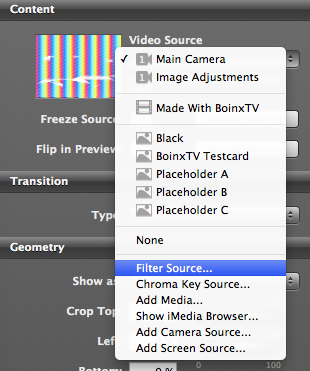 Select the video layer and choose Sources → Main Camera on the bottom. You may want to adjust the picture’s brightness a bit. You can do that under Content on the left. For best results, the streaming and receiving device, should be both on the same, separate, network. If you have no network to spare, create an ad-hoc network. Connect your iPhone to the network (in Settings). When the iPhone is connected it won’t show a network availability icon in the upper bar where the clock is! The app will work though. Now launch the app. It should connect shortly thereafter. A menubar icon (on your Mac) will appear when a connection has been established and, most importantly, your iPhone’s camera will be on the projector’s wall. The only downside of using the Mac’s ad-hoc network is reduced WIFI reach. We had good results with 20m from the camera to the phone though. Make sure the Mac stands elevated above the attendees’ heads! This makes it easier for the computer to receive the signal.